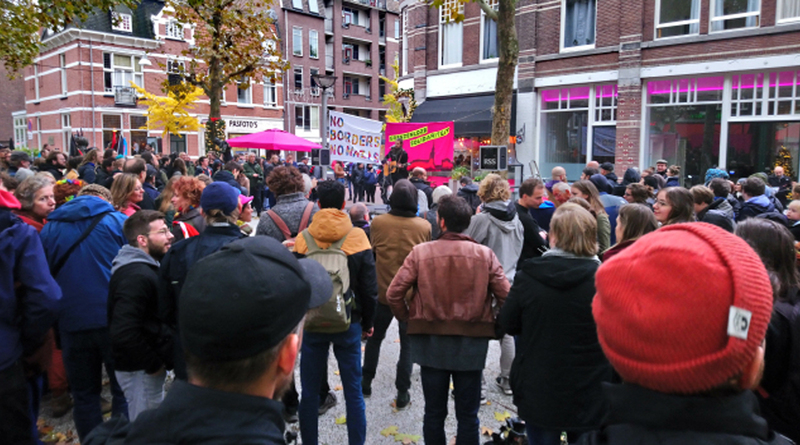 On Saturday 10 November, more than 250 demonstrators gathered at Faberplein to take a stand against racism and fascism. The action was organized by Nijmegen against Racism because the neo-Nazi organization Racial Volunteer Force (RVF) had announced that it would be demonstrating in the center of Nijmegen on this Saturday, exactly 80 years after Kristallnacht. The RVF demands the closure of socio-cultural center De Grote broek, which they regard as a hotbed of anti-fascist resistance. The presence of a strong left, extra-parliamentary movement in Nijmegen has been a thorn in the eye for the extreme right. Since the RVF had not received permission from the municipality to demonstrate at the door of De Grote Broek, they had officially canceled their protest earlier this week. Nevertheless, there was a real chance that members of the extreme right-wing organization would still travel to Nijmegen to seek the confrontation. In protest and self-defense against these violent neo-Nazis, Nijmegen against Racism organized a manifestation against Racism on the Faberplein, near De Grote Broek. More than 250 young and old, born and new Nijmegen people came to Faberplein that afternoon to take a stand against racism and fascism. They have shown that there is indeed no room for racism in Nijmegen, and that De Grote Broek is part of a diverse and inclusive local community, which has a high level of equality and solidarity. Volgende: Volgend bericht: Kom jij het team van de Klinker versterken?